It can be a dangerous job to be a truther or reporting for the alternative media. The internet is helping to uncover and expose the targeted harassment of journalists and activists alike. From hit pieces in the media to unidentified people entering their homes when they aren’t there, being an FBI or mainstream media target is definitely not fun and games and needs to be taken seriously. For anyone who doesn’t already know, Jake R. Morphonios is an investigative journalist for The End Times News Report YouTube Channel and former political strategist and adviser to several campaigns, including those of presidential candidates Steve Forbes and Ron Paul. He owns a couple of small businesses but has recently been putting in ten hours a day into making YouTube videos. Morphonios has been investigating and reporting on several high profile cases, including a Hollywood-DC trafficking network he claims is the real PizzaGate scandal. Back in March 2017, Morphonios came under attack when an unidentified person tried to gain access to his online accounts, including an old FedEx account he rarely used. His PayPal and Patreon accounts were frozen after several unexpected and failed login attempts, so he was unable to make any withdrawals. One of his video reports into child trafficking resulted in the threat of a 5 million dollar lawsuit and his car was tampered with, including the oil and anti-freeze being completely removed. See this video to find out who targeted him. He recently released a few video reports on the shooting in Las Vegas. He broke some major details in the case, very early on which resulted in the videos receiving a massive 2 million views. He claims the videos did not break any of YouTube’s rules. He was contacted by YouTube with a threat to have his channel taken down completely. The majority of his videos have been demonetised. Morphonios had a previous YouTube Channel completely deleted under very similar circumstances back in 2014. To protect his current channel he has had to take down the videos on the shooting in Las Vegas. Morphonios maintains that the Las Vegas shooting was a false flag attack and that the FBI recruited someone to carry it out. Not only that but he says his computer was hacked and some very important research on the shooting in Las Vegas was deleted. He is also on his forth mobile phone this year which he claims are continually hacked. He believes these videos are the cause of an escalation of the harassment he has been under from unknown entities. His activities have caught the attention of, he alleges, the FBI or other Intelligence Agencies. In this video below, Morphonios says that yesterday he got a call from his wife and 6-year-old son that her van had been sabotaged. While driving on the highway, the tyre blew out and she had to call recovery to tow the car away to be fixed. He said he was unable to pick her up himself because his car was also sabotaged recently! He said he suspects their vehicles were targeted by one of the American Intelligence Agencies. One of the unknown entities attacking Morphonios and his family managed to get hold of photos of one of his children which have never been released to the public. The private picture of the child was posted publicly with the threat that their throat would be slit. In June 2017, Morphonios released a video of his laptop being hacked, live on camera, while someone was remotely looking at his files! Morphonios sounded calm while he recorded the footage which he says he took as evidence to prove to his viewers that it was really happening. Another case of harassment was against Suzie Dawson, an independent journalist from New Zealand. Suzie has garnered some powerful enemies after reporting on the Occupy movement, WikiLeaks, the FBI and the Kim Dotcom saga. Dawson says she was targeted by the New Zealand and American intelligence agencies. In this video Dawson describes the kind of harassment and targeting that activists like herself endure. This video makes for chilling viewing! I don’t recommend watching this while home alone! On her website, Suzie makes this statement regarding what motivates her activism. 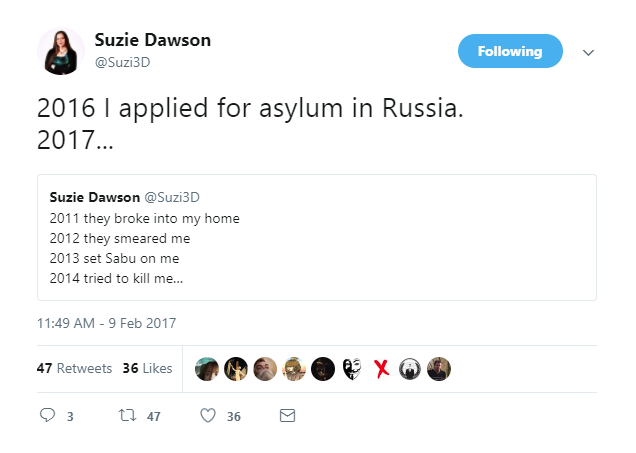 Impolitikal reported that in January 2015 Suzie was forced to leave New Zealand to live in exile in Berlin and currently resides in Moscow. 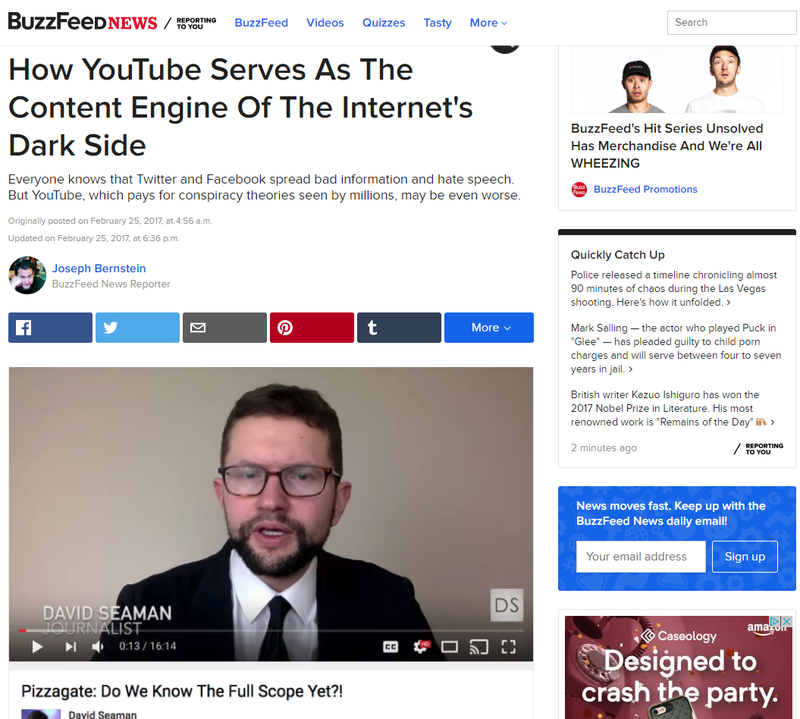 The Journalist David Seaman, a core force investigating Pizzagate, also came under similar types of attacks and Buzzfeed ran a hit piece on him back in February 2017. Followers of Seaman were then stunned when all his videos disappeared from his YouTube Channel and his Vid.me account on February 26th, 2017. Popular YouTuber Styxhexenhammer666 has commented on the power of the Streisand Effect on many occasions. The ongoing suppression of the people in this article, it could be argued, has and will continue to facilitate and increase their exposure and popular support. Suzie Dawson is now the Leader of the New Zealand Internet Party. David Seaman continues to report regularly from his YouTube Channel which has 148,000 subscribers. Jake Morphonios is still reporting from his YouTube Channel which has 77,000 subscribers. 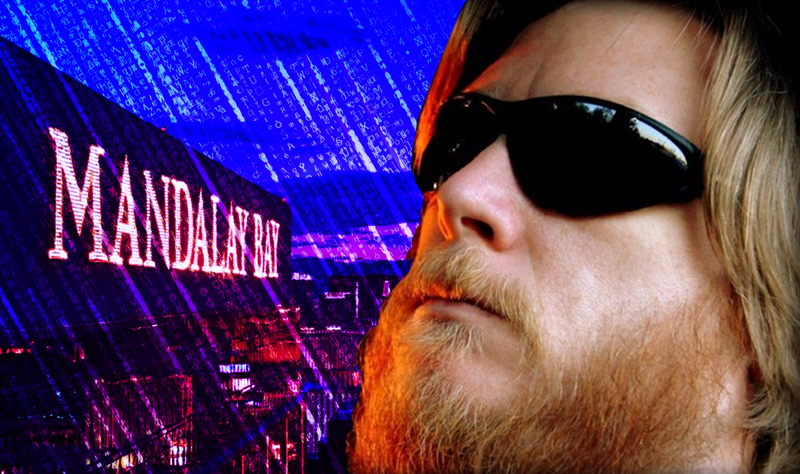 MAKE SURE TO CHECK OUT JASON BERMAS’ LATEST VIDEO ‘Las Vegas Shooting. The Facts So Far’ HERE!